Krosstech industrial tooling cabinets are ideal for industrial applications and serious workshops. 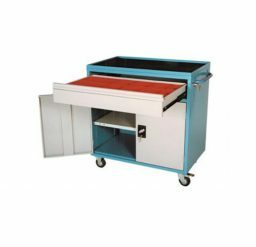 These feature packed, multi-functional product, combines tool storage, small part storage and a durable rubber mat work surface. 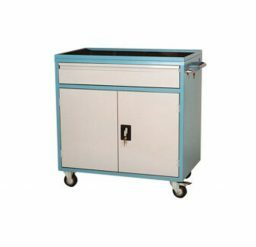 Krosstech mobile tool cabinet is a comprehensive workstation with backing panel perfect for optional hooks, prongs & holders. 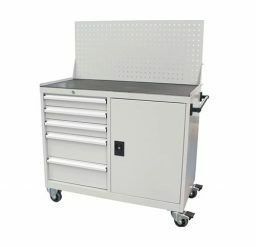 This tool cabinet has 5 key lockable underbench drawers and cupboard. The top drawer includes a series of different size plastic boxes for those small items. All other drawers come with adjustable steel dividers. Krosstech tradesman trolley is a compact storage station with one drawer and one cupboard, both lockable.